An angry Henrik Kristoffersen of Norway reacts at the finish line after spectators threw snowballs at him during the men’s World Cup slalom in Austria. SCHLADMING, Austria — The season-long battle between slalom rivals Marcel Hirscher and Henrik Kristoffersen became a snowball fight for once. None of the projectiles hit Kristoffersen but the Norwegian was furious as he reacted with wild arm gestures after crossing the finish. ‘‘That was disrespectful. 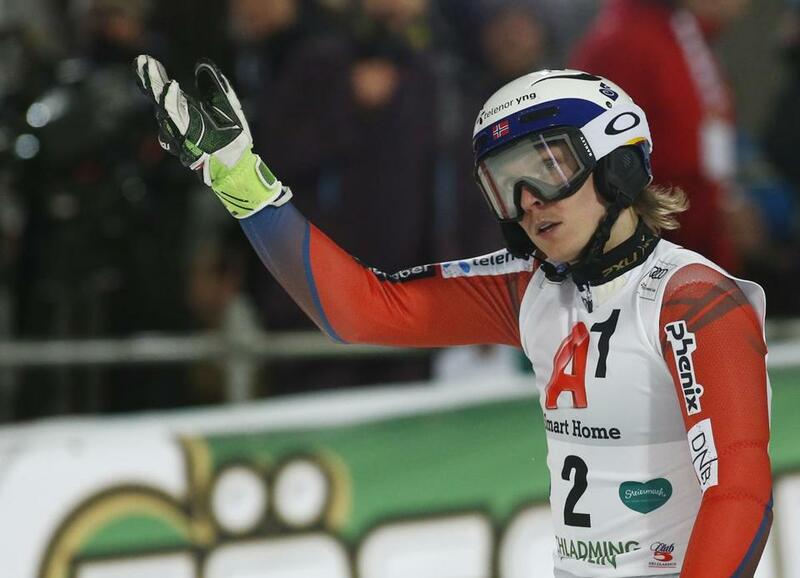 That was not cool at all,’’ said Kristoffersen, adding the incident distracted him but did not cost him the victory. Hirscher, the Austrian six-time overall champion, built on his first-run lead to win by 0.39 seconds. In the final slalom before the Pyeongchang Olympics, he and Kristoffersen were far ahead of the field as third-place Daniel Yule of Switzerland was 2.13 seconds behind. ‘‘I would not have beaten him even if there were no snowballs. Marcel was better today. We are in a league of our own, this battle is really great,’’ said the Norwegian, who beat Hirscher in a slalom in Kitzbuehel two days ago. Together they have won seven of the season’s eight World Cups in the discipline. ‘‘One time I am ahead by a few hundredths, the next time Marcel is ahead by a few hundredths. Let’s see what happens at the Olympics,’’ Kristoffersen said. Hirscher, who didn’t see the incident from the starting gate, apologized to Kristoffersen immediately after the race. Hirscher got the record despite breaking his ankle in the offseason and missing his entire preparation period. ‘‘Maybe I should do that more often. Not breaking my ankle, but taking more time off,’’ he said. Among the spectators was Hirscher’s close friend, motorbike rider Matthias Walkner, who had just returned from South America where he won the Dakar Rally. ‘‘I will share a drink with Matthias tonight. It won’t get much better than this,’’ said Hirscher, whose win was the 500th by an Austrian man in the 51-year history of the World Cup. The men’s World Cup continues with a downhill and a giant slalom in Garmisch-Partenkirchen, Germany, this weekend.